Area: East L.A./Monterey Park (mural number 21 (L) in Street Gallery). 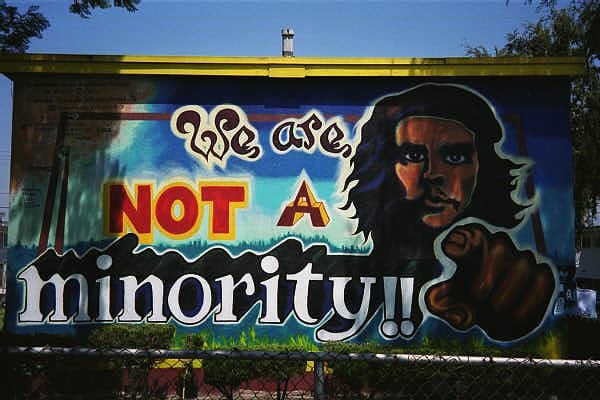 This tribute to Che Guevara was painted in 1978 by artists from the Chicano PArk struggle in San Diego. It was restored in 1995 by MCLA. The mural reads: "In memoriam to the Guevrillero Heroico, el Doctor Che. Dia del Rebelde International XI aniversario Oct. 8th 1978." The original artists were Mario Torero, Rocky, El Lion, and Zade. Therestorers were Mario Torero and Carmen Kalo, assisted by Ernesto de laLoza. Photos copyright 2000,2001,2002 Rich Puchalsky.